We’re from the Government, and we’re here to destroy small businesses through burdensome regulations that will put each one out of business and create a monopoly through regulation. E-cigarettes. Vaping. Or other choice profanity words are often used to describe those of us that either reduce or stop smoking traditional cigarettes and replace them with an alternate nicotine delivery device. I’ve posted my story on vaping before, the short summary is that I tried quitting cigarettes many times over a 9 year period was not successful until I replaced that bad habit with a less bad habit. In the usual Big-Government Nanny-State fashion, the Food and Drug Administration has arbitrarily decided that they have the authority to regulate e-cigarette and vaping products. Now, on the surface, you’re probably thinking this is not such a bad thing. I mean, people inhale this stuff, right? Shouldn’t we want it to be regulated in some manner to ensure people’s safety? The added regulation could have far-reaching consequences for the e-cigarette and vaping industry. It will cost an estimated $1 million or more for each e-cigarette or vaping product to seek federal approval, and that price tag will force most of the small manufacturers that make vape juices — or “e-liquids” — out of business, leaving only tobacco giants to compete, industry figures warn. Those regulatory validation fees of $1 million? Seems pretty steep for an regional industry. There is no “Big E-Cig” industry with some corporate fat-cat Board of Directors. No national level franchises. No shareholders. No uber-rich elite 0.0001% billionaire class. They are quite literally the epitome of a small business that operates in area communities. And their businesses will be destroyed by the FDA. Look, if you want regulation on the vaping industry, I’m all for it. If the FDA wants to make sure the ingredients are what they say they are, also I’m all for it. There’s absolutely no reason for the FDA to charge 7-figure testing fees to validate a 4-ingredient viscous liquid. Literally, there are 4 things that go into e-cigarette fluid: vegetable glycerine, propylene glycol, flavoring, nicotine. So all you need to do as the FDA is make sure those products are present, not modified, and the nicotine concentration is as described. A high school student could probably perform that testing in their chemistry class, so there’s no reason for a punitive licensing fee to be applied by the FDA. We all know the truth. These regulations are not about safety. They are about control. 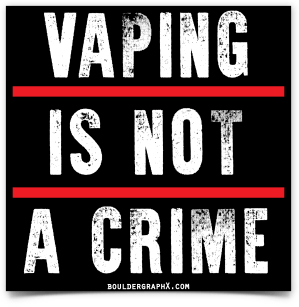 1 Comment on "FDA will regulate (destroy) e-Cigarette industry"
I so deeply, deeply hate the federal government. It exists to extract as much wealth from the people for transfer unto itself as possible and to enslave the people through unavoidable debt. The federal government is evil personified.